Our Midnight Black IceBoss Elite will be the perfect compliment to your kitchen, boat, office, mini-bar and more! This is the one item that will be the hero at any party year around. Like its commercial quality cousins in the restaurant business, the IceBoss Pro stands above the rest in shining Stainless Steel. The IceBoss Pro compliments your kitchen, office, mini-bars and more, featuring one-touch control buttons for simply operation. ElectroBoss quality in an affordable package! 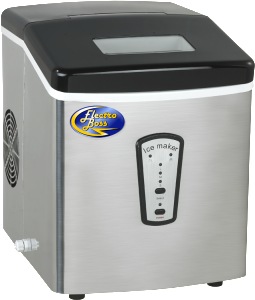 Our IceBoss quality portable ice machine beats nearly every machine on the market in performance and price. The IceBoss makes 3 different ice cube sizes and up to 33lbs./day. Ideal for the kitchen, home bars, recreation rooms, boats or campers – just about anywhere ice is needed! In just a few short minutes you will have your first batch of ice.